The metal frame that holds all the components of a subwoofer together. The basket's rigidity and resistance to resonance help determine the sub's sound quality. 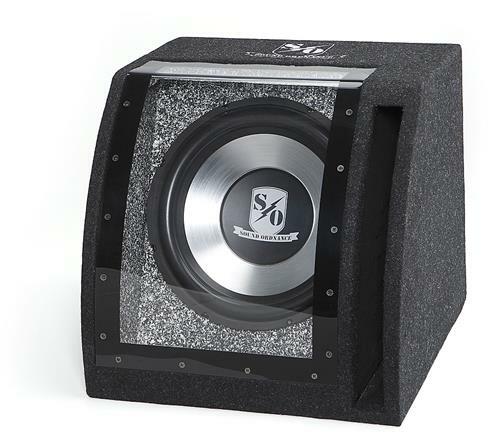 This measurement, listed with each component subwoofer, tells you the recommended interior volume in cubic feet that an enclosure should have to get the best performance from the sub. A variation of 10-20 percent is generally acceptable. The ability of an amplifier to control the movement of a subwoofer — the higher the damping factor, the greater the accuracy. Damping factor is calculated by dividing the subwoofer impedance by the output impedance of the amplifier. An amplifier's damping factor will decrease as the sub's impedance decreases — that's why an amp running at 4 ohms will provide tighter bass than at 2 ohms. This spec is not always given for all amplifiers. Another dB fact: For any given set of speakers, each 3 dB increase in volume level requires a doubling of the amplifier power. While typical speaker drivers have one voice coil, dual voice coil (DVC) subwoofers allow you the advantage of flexibility in wiring your system. Parallel wiring provides for maximum amplifier output, while series wiring lets you configure multiple woofers to one amplifier at an acceptable impedance. In series/parallel mode, you can wire 4 woofers to a single amp, for example, and still maintain a compatible impedance. 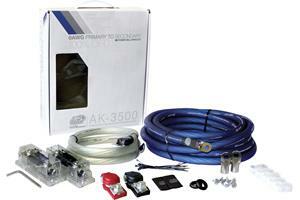 Independent wiring lets you drive a single sub without bridging (or by bridging a four channel amp to one sub). Sealed box — A sealed box is an airtight enclosure housing your subwoofer. A sealed box is best for any music that demands tight, accurate bass. Expect flat response, deep bass extension, and excellent power handling. Since a sealed enclosure tends to require more power than a ported box, use an amplifier with ample wattage for optimum performance. Ported box — A ported box uses a vent (called a port) which allows movement of air in and out of the enclosure chamber. This additional air movement reinforces low bass response. You get more output from a ported box than you would from a sealed box at any given level of amplifier output. Some people simply prefer the sound of ported boxes for rap, techno, or any hard-driving music because they play louder than comparable sealed boxes. Bandpass box — A bandpass box is a special type of ported box designed for maximum slam. The woofer is mounted inside a dual-chambered box; the woofer fires from the sealed chamber into the ported chamber, and sound waves emerge from the ported side. Because the sound that comes out of the port is extra loud within a narrow frequency range, bandpass boxes are considered super efficient. Their aggressive sound is popular with many hip-hop, techno, and metal fans. 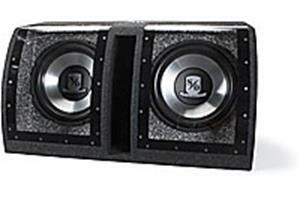 Free-air subwoofers — A free-air system consists of woofers mounted to a board attached to the rear deck or placed in the trunk against the rear seat. The trunk acts as the enclosure housing the subwoofer. Free-air systems save space and have flat frequency response. The woofer must be specifically designed for free-air use, and the trunk must be airtight for best results. The range of sounds from lowest to highest that the subwoofer is capable of reproducing. The figures listed with the drivers are furnished by the manufacturers. The actual range you'll hear can vary depending upon the type of box, crossover point, and the vehicle the subwoofer is installed in. Under most circumstances, a typical sub will play slightly deeper than its published figures indicate. So, don't base your choice solely on this spec. The resistance offered by an electric circuit to the flow of alternating current — measured in ohms. A subwoofer rated at 2-ohm impedance will produce more output than a 4-ohm subwoofer, given similar input wattage, because the resistance is lower. The amount of power the subwoofer can handle as a brief burst during a musical peak. 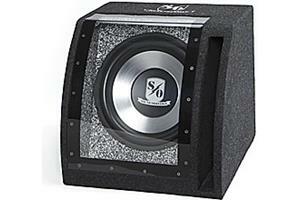 You should not drive your subwoofer continuously with wattage equal to the peak power rating. In order to get the polarity right, you must wire the positive speaker terminal to the positive amplifier terminal, and the negative speaker terminal to the negative amplifier terminal. Proper wiring ensures that all the cones in a multiple speaker setup will move in the same direction at the same time. If you wire your speakers improperly, one speaker cone will move backward while another is moving forward, canceling out much of the sound both speakers are trying to make. In multiple component subwoofer systems, getting the polarity wrong could short-circuit the amplifier's output, resulting in overheating and damage to the system. A solid piece of steel which protrudes up through the magnet into the voice coil assembly, concentrating the energy from the magnet. 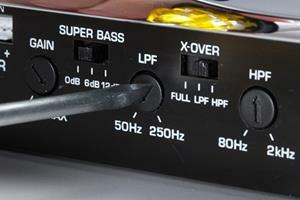 An external power amp is required to drive any raw component subwoofer. (Don't try to drive one with your in-dash receiver's built-in amplifier.) The low number listed is the absolute bare minimum wattage required to get acceptable sound from the subwoofer. For best results, use an amplifier that provides a power level (RMS, or continuous watts) in the upper part of the subwoofer's recommended range (RMS). Also referred to as efficiency (measured as SPL — sound pressure level), this specification is quoted in decibels (dB). The higher the number, the more efficient the subwoofer is at turning amplifier power into sound, and the louder it plays. A subwoofer rated 3 dB more than another will require only half the power to produce the same output. The spider (also known as the damper) controls the cone's movement and keeps the voice coil centered in the air gap. It acts like a shock absorber, smoothing out the cone's ride. Part of the sub's suspension, the surround keeps the cone centered as it moves in and out of the basket. It's usually made of a durable material like treated foam or rubber in order to withstand the punishing job of producing big bass. 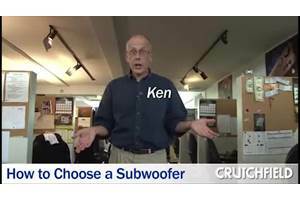 These are terms used to describe the characteristics of a particular subwoofer. They include resonance frequency of the driver, the woofer's excursion, and air displacement, among others. These figures are useful in predicting subwoofer performance and constructing appropriate enclosures. Tells you the depth of the woofer when it is installed from above the mounting surface. The depth will be greater for subwoofers that are mounted from below the mounting surface. The voice coil consists of a former (or bobbin) with wire wound around it. The voice coil is attached to the bottom of the cone and extends into the air gap surrounding the pole piece. The voice coil translates the magnet's energy into cone motion.